Last weekend I woke up to a winter wonderland! 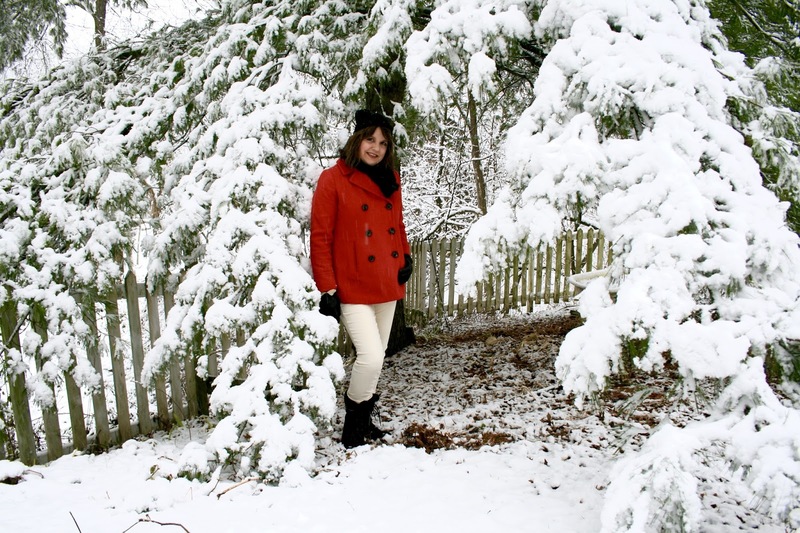 It was so gorgeous that I couldn't pass up a wonderful photo opportunity, so I rushed to get dressed and take pictures of both this beautiful fresh snowfall and do some fun fashion photography as well! Now anyone who knows me knows I am not a big fan of the snow or cold, but even I couldn't deny it's amazing beauty! 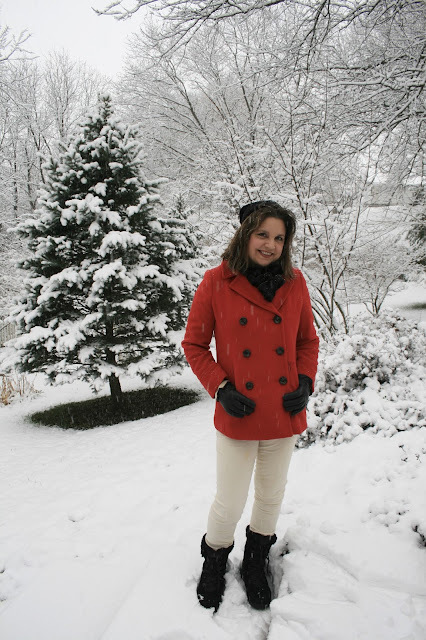 And what better way to show the pristine white snow than with a bright red peacoat up against it? This is a coat I purchased at an end of season clearance sale at JCPenney for $6.00. Yes, you heard me right $6.00!!!!! It was the end of a very unusually warm winter, so a lot of people did not buy a new winter coat. The store was so desperate to get rid of them, they were practically giving them away. They had so many different styles and colors of other winter coats as well. I really did not need another winter coat (I have so many as it is) but for $6.00, why not? I also bought a new black pleather jacket with a fur collar that day...for, yes, $6.00. I styled my coat with winter white corduroy pants, a winter white novelty sweater, and black boots, scarf, hat, and gloves. Pea coats aren't that practical for a Wisconsin winter; which is one reason I hesitated to buy it. I didn't think I'd get that much use out of it. But again, for $6.00, why not? I've been trying to get into the habit of wearing hats more often. I had a hard time keeping this one on my head because I placed it just on the back of my head. I've since seen them pulled all the way down so that the forehead is partially covered. I tried it that way too, but I looked ridiculous. I have such a funny shaped face for that look! Can you believe these evergreen branches? They are so heavy with snow they touch the ground. All the pictures were taken in my garden. You can see just nature shots of this same garden and snowfall in yesterday's blog post. Everything I'm wearing is old, but I will provide links to current like items at the end of the post. And here is my novelty sweater. I picked it up the day after Christmas last year and previously showed it to you HERE and HERE. It's such a fun sweater, even though I only get a couple of wears out of it a season. It was definitely worth the $10.00 I paid for it. I think this was one of the few times I actually enjoyed doing fashion photos outside in the winter. My husband and I had such a blast exploring our yard and seeing all the new beauty thanks to the fresh fallen snow. Red Peacoat (no longer available) similar HERE, Ivory Corduroy Pants (no longer available) similar HERE, White Holiday Novelty Sweater (no longer available) similar HERE and HERE, Black Beanie (no longer available) similar HERE, Black Leather Gloves (no longer available) similar HERE, and Kamik Boots HERE. 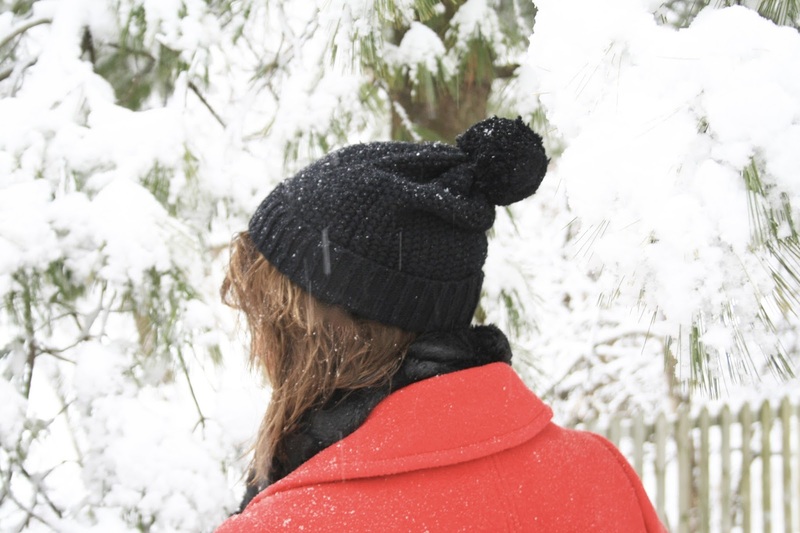 Red is perfect against all the snow! 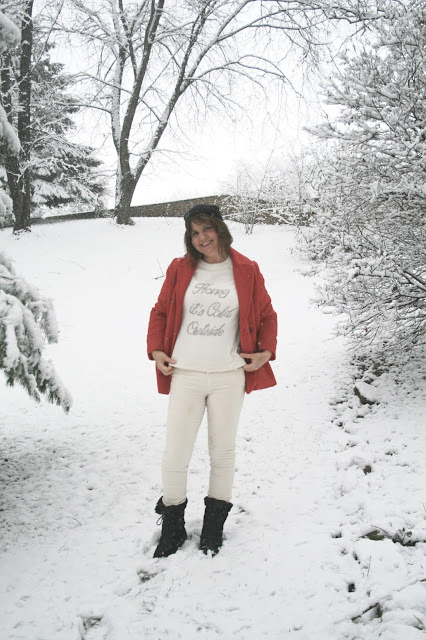 We actually have a delay this morning because of snow/ice so I decided to to do a little online shopping and went ahead ordered the sweatshirt you showed a few days ago :) It has such a fun sentiment and I'm not one to pass up a good bargain! Oh I'm so happy you got that sweatshirt! It is so much fun, and I've worn it so much since I bought it. So comfy and practical for me! Amy, just like your red shed your red peacoat really pops in against the wintry white background and I love your shirt - very cute! Thank you! Your so sweet! It all looks so pretty, as do you Amy in your festive outfit. You look excited to be out in the snow ... I certainly would be! Thanks Mary, I was excited! Man, and I thought I was a bargain hunter, but I'd have to say you got me beat with this coat!! LOL! Yes, I'm a bargain hunter. Thanks for visiting! Hi Amy. What bargains. I have a red car coat similar which cost me far more and I still think it good value. I got mine 8 years ago and it's still going strong. I've been looking for winter white cords in the UK. They are not to be found. Thanks Anna. It's a classic coat, so no matter what you pay for it, it'll be in style forever! What a gorgeous, classic coat! Can't go wrong with a peacoat! The color is stunning and perfect for the holidays! Thanks Sarah! I agree, it is a classic that was one of my main reasons for purchasing it. Gorgeous pictures Amy!! Stay safe in all that snow! Thanks Brooke! We've certainly been hit with the snowstorms so early in the season. Another one coming on Friday! Of course you needed that coat! It's a gorgeous festive red color and it was only $6! I love it on you! I agree, if it's going to be cold then it should at least be beautiful and snowing! I love the red pea coat, such a classic piece. Such a great look! Your sweater is so festive and adorable, and you red coat is beautiful! Love this look Amy! What a beautiful backdrop for your photos! Your sweater is darling and I love your read coat! 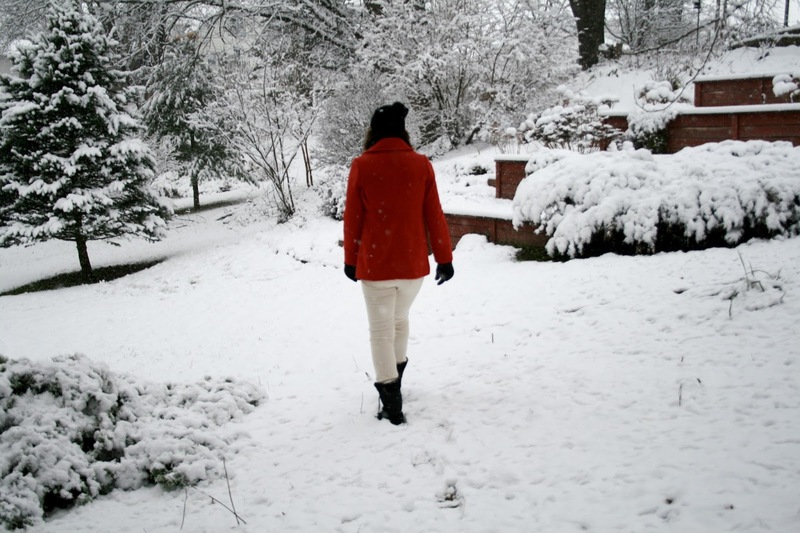 Your red coat looks perfect against the snow! And I can't believe you got it for such a steal! Thanks for sharing at the Grace + Lace Linkup! Thanks...it was a steal alright! Apparently it's closed already. Sorry I missed it. I haven't been on-line much this week due to the holidays.